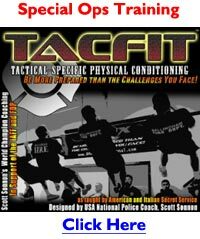 Are you looking for a Navy SEALs workout routine to push you beyond your percieved physical limits? If so, you're at the right place. The Navy SEALs are elite commandos that have to endure physical, mental and emotional stress that most humans could not even imagine. 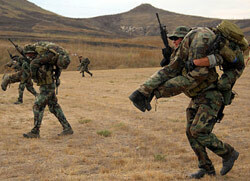 As part of their training, the SEALs go through very intense fitness regiments. This 9-week Navy SEALs Training Program is going to challenge you physically and mentally. The program involves a lot of running, swimiming and calisthenics (bodyweight exercises). For the most part you don't need any special weights, or equipment. All you need, is a good pair of running shoes, a place to swim and a chinup bar. Oh ya, and one other thing, a lot of desire and determination. Before we get the to progarm, have a look at some of the brutal training and harrowing conditions the SEALs have to go through. I hope this gives you a little more inspiration, and motivation, to make it throught these workouts. 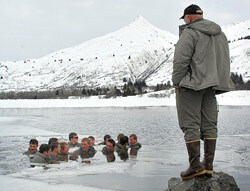 This 9-Week Navy Seals training program was designed to prepare Pararescure/Combat Control Candidate Course trainees. 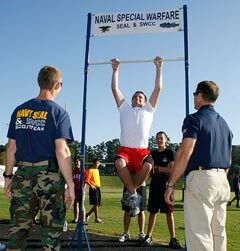 You can still give this program a try regardless if you're actually interested in joining the Navy SEALs or not. This program is guaranteed to bring your fitness to a whole new level. Please keep in mind that this training program is not easy, so just try your best. If you feel any pain, stop immediately. Also, make sure you warm-up and stretch BEFORE the workouts, and stretch AFTER too. Instructions: Perform the following three exercises consecutively with NO rest, for one set. Instructions: Swim continuously for the specified length of time with no rest. This is recovery week, no running.